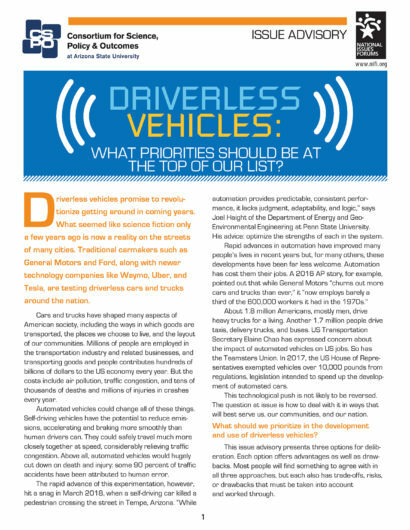 What Priorities Should Citizens Consider as Driverless Vehicles Become a Reality? A new discussion guide brings communities together to discuss a consequential and potentially transformative emerging technology: autonomous vehicles. Driverless vehicles are poised to revolutionize mobility in coming years. What seemed like science fiction only a few years ago is now a reality on the streets of many cities. 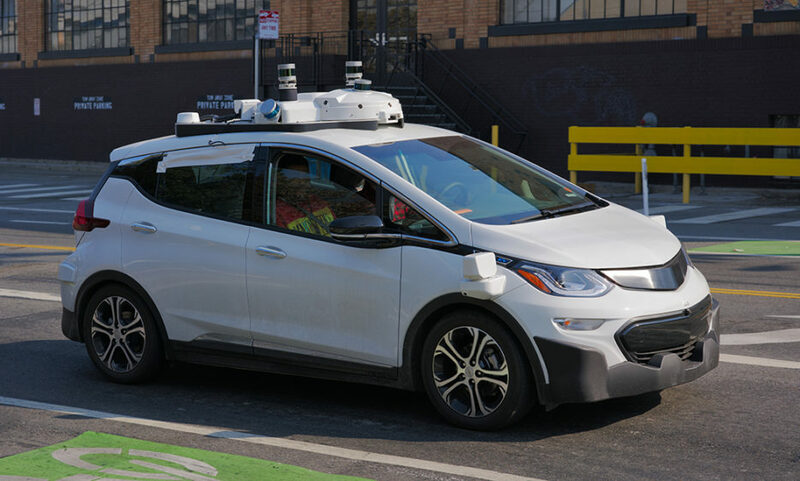 Traditional carmakers such as General Motors and Ford, along with newer technology companies like Waymo, Uber, and Tesla, are testing driverless cars and trucks (also known as self-driving or autonomous vehicles) in cities like Phoenix, Arizona, and Pittsburgh, Pennsylvania, and states like California and Michigan. Driverless vehicle technology is advancing so rapidly that the public, policymakers, city planners, and private companies are scrambling to figure out how to navigate a near-future of driverless vehicles. Human-driven cars and trucks have shaped many aspects of American society. The manufacturers and drivers of traditional vehicles have influenced how goods are transported, the places we choose to live, and the physical layout and appearance of our communities. Millions of people are employed in the transportation industry and related businesses, and transporting goods and people contributes hundreds of billions of dollars to the US economy every year. But the cost of our car-centric culture includes air pollution, traffic congestion, and tens of thousands of deaths and millions of injuries in crashes every year. The adoption of driverless vehicles could change all of these things in unpredictable and potentially disruptive ways. What should communities prioritize in the development and use of driverless vehicles? These kinds of socio-technical transitions are rarely subject to systematic, anticipatory democratic deliberation by non-expert citizens. To help communities have substantive discussions about this important emerging technology, the Consortium for Science, Policy & Outcomes partnered with the Kettering Foundation to develop an issue advisory on driverless vehicles. The advisory was developed with input from focus groups with citizens that CSPO held in rural (Cumberland) and urban (Baltimore) Maryland. The advisory presents three options for deliberation. Each option offers advantages as well as drawbacks, which allows participants not only to explore how the technology may change their communities, but to identify the priorities and social benefits that the technology may help them achieve. Read or download the issue advisory on the National Issues Forums website here. For more information about CSPO’s work on autonomous vehicles and plans for future deliberations, visit our project page or contact CSPO associate director Mahmud Farooque.